The Excrement Hits The Oscillating Unit! Wednesday evening the Daily Pilot published an excellent piece by Bradley Zint that addressed allegations made at a Costa Mesa City Council meeting a week ago that there was impropriety in the allocation of playing fields, HERE. You will recall that we addressed that issue in our post about that meeting on February 4th, HERE. At that time resident and softball player Roger Chadderdon waited until past midnight to step up during the "trailed" public comments segment to complain that his adult softball team and a youth team had been displaced from the TeWinkle Sports Complex, being replaced with Matt Leinart's Flag Football program. He was confronted by Mayor Pro Tem Steve Mensinger at the end of the meeting. At that time Chadderdon also stated that Recreation Manager Bob Knapp had lost his job because of that situation. Well, Zint's piece delves deeply into this situation and tends to confirm that Knapp did, indeed, resign when he balked at displacing long-time users in favor of Leinart's program. He doesn't name names when asked about who directed him to oust the softball programs in favor of Leinart's program, but he is quoted as saying it was not a council member. A quick peek at the video clip of the May 23rd Parks and Recreation meeting, HERE, will permit you to hear a discussion by the commission about the Field Allocation Use Police. Shove the scroll bar over to 2:51:00 for the beginning of the conversation. This seems to be the preamble of what happened. And, you can also read articles in the Daily Pilot HERE and HERE that mention the involvement of Matt Leinart in local activities the middle of last year. Some eyes are now raised because his program - a new program to Costa Mesa - managed to shove long-established groups off of their scheduled fields AFTER the money had been paid and schedules established. This article generates more questions on an issue that has a less than fragrant aroma coming from it. 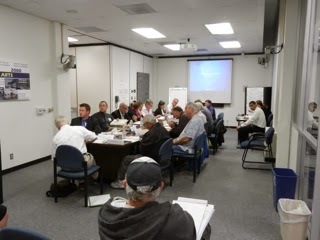 The Costa Mesa Charter Committee, facilitated by Dr. Kirk Bauermeister and Dr. Mike Decker, met again Wednesday evening - this time in the cozy confines of Conference Room 1A - to continue their task of creating a document that will change the way Costa Mesa is governed if approved by the voters in November. The number of visitors was much smaller than usual and the venue doesn't lend itself to hearing what the participants are saying - especially with no microphones. The schedule now provides for two more meetings at which the members will hammer out some sticking points on a few issues, then begin to fine-tune the language of the document that will be presented to the City Council early in March. We were told that there is tentatively a "little reception" planned for the members before the City Council meeting on March 18th to honor them for their hard work. 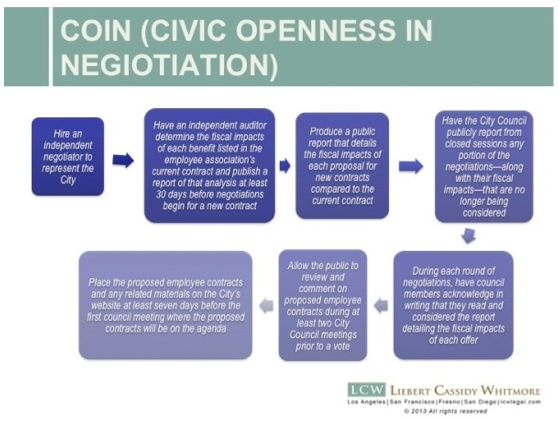 Wednesday night they discussed whether or not to include a reference to Steve Mensinger's COIN program regarding labor negotiations, Conflict of Interest language, the Form of Government, and the probable Pension Timeline if the Charter were to require voter approval. This group continues to work harmoniously, but the strong political orientation of certain members always eventually shows through. Having observed most of these meetings I can state with some degree of authority that partisanship on both sides is frequently very evident - and it detracts from the work. At the next meeting they will discuss Paycheck Protection - that's the scheme Righeimer and his pal and lawyer, Mark Bucher, tried unsuccessfully to foist off on voters in the past, including in Righeimer's Proposition V - that soundly-defeated attempt to hijack the process the last time around. They will also discuss Eminent Domain, review the Preamble and the entire document. I was not surprised when member Gene Hutchins suggested they bring back the language of Measure V before they finalize the document. He's been spouting that mantra since the very beginning, apparently oblivious to the fact that the electorate soundly rejected it. It will be very interesting to see what part of Measure V gets folded into this document, and whether the City Council will include it as they review the work product from the committee for possible placement on the November ballot. So, the next meeting of this group will be at 6:00 p.m. on Wednesday, February 26th in Conference Room 1A. In what may be the shortest City Council Study Session ever, this afternoon the Costa Mesa City Council heard all they needed from Interim Finance Director Steve Dunivent on the city's mid-year budget performance in 45 minutes flat! Actually, it would have been much shorter but for Mayor Jim Righeimer's direction near the end. More on that in a minute.. wait for it. 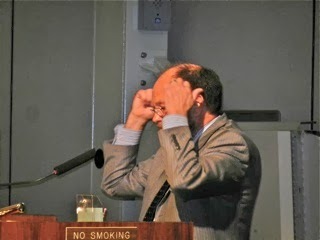 As you can see from the photo, the crowd was "sparse" - a kind way of saying that virtually nobody gives a rat's rear end about the condition of our finances. Only four residents showed up. They, plus sixteen city staffers and two journalists, were in the auditorium . I counted myself as a resident. Councilmember Wendy Leece was absent. Unfortunately, this is pretty typical of these kind of meetings. In years past when Allan Roeder would conduct a "Community Budget Workshop" following the approval of a budget there would typically be three or four residents in attendance. This meeting was televised live on CMTV, but the recorded version is not yet posted. 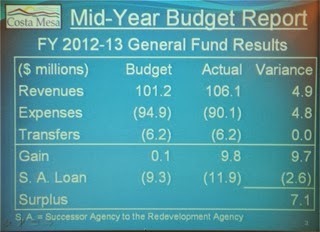 Dunivent spoke of the budget surplus and showed charts that were not part of the printed agenda report. 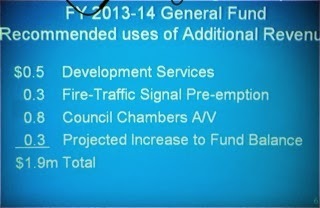 He gave us examples of his recommendations for the use of the surplus. 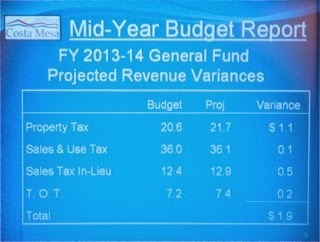 He spoke of the anticipated increase in projected revenues. And how those funds might be used. However, the most interesting part of the evening for me came at the end, right around 5:00, as council members chimed in with their thoughts. 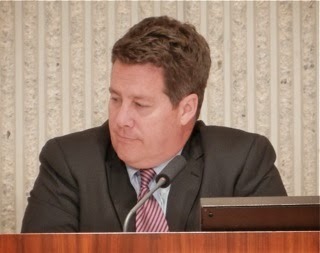 CEO Tom Hatch, when pressed for more details on issues, kind of acted like a kid caught with his hand in the cookie jar. 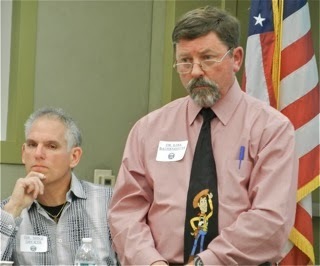 Steve Mensinger and Gary Monahan challenged him to produce some specifics on a few issues. Monahan said he wanted, "hard numbers, not hunches." Then Righeimer began his little exposition by starting with this sentence fragment, "The City is fifty-some years old..." Really? After all the turmoil about the 60th Anniversary Celebration and he still doesn't know how old the City is?! How is it possible that he can be so vacuous? Good grief! He just keeps on having these "Linda Blair" moments - he opens his mouth and out comes his stream-of-consciousness "guacamole". INCREASE FEES AND CREAT NEW ONES! Now that he had my attention he went on to tell us that he wanted us to consider increasing Park Fees and Planning fees and establish Undergrounding Impact Fees and a Library Impact Fee - all of which would be levied on developers who come before the city to build stuff! Yep, that's what he said! In fact, I'm going to paraphrase him - you can check it when the video feed is available - he said, "As the economy goes up we need to put a little drag on that." - meaning take advantage of developer interest in the city to squeeze more dollars out of them - which, of course, would just be passed on to buyers of their homes, etc. I guess that's his strategy to attract young families to the city - slap so many developer fees on new homes that only the rich can afford them. That "Undergrounding Fee" is interesting. Those who pay attention will recall that former Mayor Allan Mansoor also floated that scheme - to underground all utilities throughout the city - a few years back. At the time, based on numbers from the utilities involved, it was projected to cost in excess of a half billion dollars! A couple years later that estimate was bumped up to a cool Billion! I can't even begin to guess at what it might be now. And that was just the city costs - the homeowners would have to pay for the utilities to go from the street to their homes. 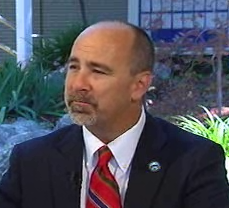 Righeimer prattled on about a "utility districts" - like Newport Beach has done in the past. Well, that idea was also blasted out of the water several years ago and it sure isn't going to fly now. I'm getting very tired of him trying to morph Costa Mesa into Newport Beach or Irvine with his elitist, let-them-eat-cake attitude. If that's what he wanted when his political career stalled in Fountain Valley (that means when the voters rejected him) he should have moved into one of those cities, not Costa Mesa. More on that "Library Impact Fee"... he also said that he wants to set aside "a couple hundred thousand" to investigate the possibility of moving the Donald Dungan Library at Lions Park into the Neighborhood Community Center - which he implied was underutilized with "a few meetings and birthday parties on the weekends", and then use the current site of the library as a "nice, round meeting room". Now, that's one of the strangest things I've ever heard him say - and that's saying a lot! It's my understanding that booking space at the Neighborhood Community Center has been very difficult lately. 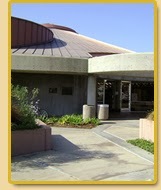 Monahan chimed in to say that it should be a state-of-the-art library with heavy emphasis on computers, etc. The only reason I can think of for Righeimer to want to basically shut down the Neighborhood Community Center is because it provides a venue for discussion of important issues - and those discussions never work in his favor. 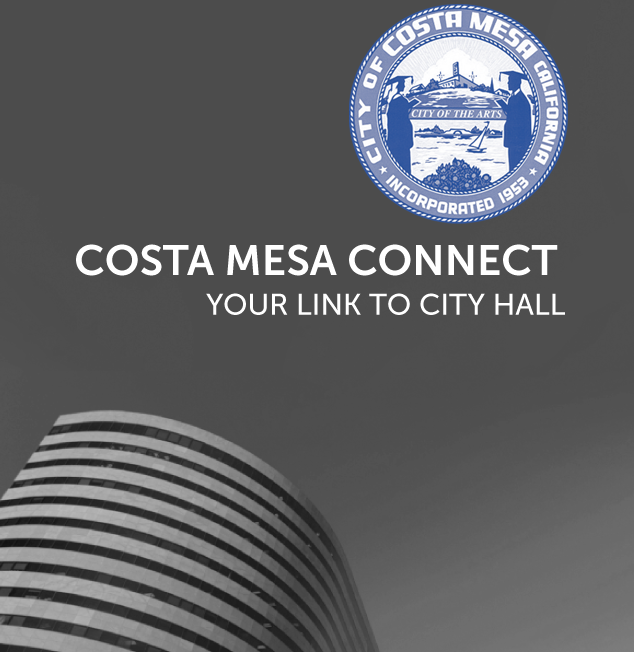 The City of Costa Mesa just announced the availability of a new app for smartphones that is, in their words, "a civic engagement tool that allows residents to conveniently access city services". Read all about it HERE. I've downloaded it and have played around with it just a little. It looks like a good tool. Check it out! I may play around with it some more while sitting in City Council Chambers this afternoon during the Mid-Year Budget Review. Starts at 4:30... see you there. OK, I'm back at 7:00 p.m. - the Study Session was a record - 45 minutes flat! More on that later. Denigrating the Good Name of the City by Referring to it as "Costa Mayberry"
Claiming Someone Trespassed on Your Property to Place a Tracking Device on your Truck, Then Later Admitting That You Can't Park the Truck on Your Property Because the Driveway is Too Short. That's just for starters... I expect some of you will think of others. All in all, I like this new app. I think it will be easy to quickly locate important information. It's going to be interesting to see how this plays out. 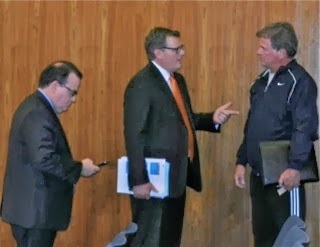 The Costa Mesa Planning Commission, led by the ever-exciting, "cool" and "excellent" Chairman Jim Fitzpatrick, plowed its way through another meeting Monday night. The short Public Comments segment was led off by Eastside resident Jeff McConville, who cautioned the commission about approving projects with too little parking, and used as an example the Greenleaf Chop House on Westminster near 17th Street. Because of the great success of the restaurant, according to McConville, patrons park blocks away in residential neighborhoods, which negatively impacts the quality of life in those neighborhoods. Lisa Morlan bemoaned the proliferation of rehab homes on the Eastside and requested a list of non-licensed facilities in the city. Fitzpatrick responded by telling her of the Task Force Mayor Jim Righeimer is theoretically putting together and said he'd do what he could to get Morlan and her husband included. An hour and forty minutes was spent on Public Hearing #1, an appeal of a staff decision regarding a home on Wimbledon Way. It was the strangest hearing I've seen lately. As shown here by the exasperation of the attorney for the appellant, things were just a little confusing. Normally when someone appeals a decision they make their pitch for the reason. Then the opposing party presents his side, then the appellant has a chance to respond. This one was just the reverse. The party who was the beneficiary of the staff decision went first - and last. Very peculiar. In the end the commission upheld the staff decision on a 3-0 vote - Vice Chair Rob Dickson was absent and Tim Sesler had to recuse himself. Since the appellants had a lawyer, I suspect this is not the last we've heard of this issue. Just before 8:00 the commission began a discussion of Public Hearing #2, the request by the Wild Goose restaurant on 17th Street to do a massive expansion - nearly quadrupling its size. This item was not supposed to be "heard" Monday night - the agenda report said it was going to be continued until the next meeting, on February 24th. 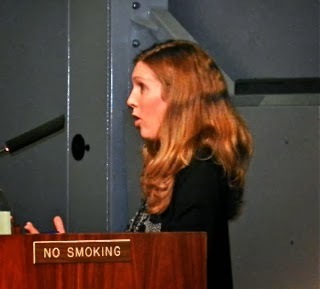 However, a half-dozen residents, including Katie Arthur, showed up to speak to the issue - all expressing negative reactions to this request due mainly to parking, traffic and noise issues. This proposal is severely under-parked by any standard - one speaker said it was requesting only 36% of the parking spots required by our codes. After a half-hour of conversation it was decided to move the issue to the meeting on 3/10/14 to give staff time to re-notice it to impacted residents and business owners. Public Hearings #4 and #5 were alcohol licenses for two new businesses at th SoCo center on Hyland. There was little discussion of either and both were approved on 4-0 votes. The final item on the agenda was the report regarding complaints about noise by G&W Towing from residents and management of the adjacent mobile home park. The report indicated that the firm has made some appropriate changes to mollify the neighbors so no further action will be taken. That was it! It took until 10:10 Monday night to accomplish that bit of business. 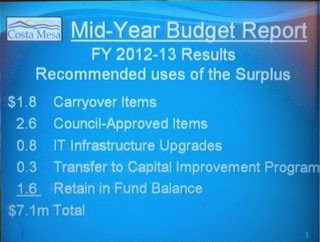 Next up on Tuesday is the Mid Year Budget Review in City Council Chambers starting at 4:30 Tuesday. This should be VERY interesting. It's going to be another busy week in Costa Mesa. Four important meetings on four consecutive days... Whew! Public Hearing#1 - A request for first and second story additions at 3384 Wimbledon Way, HERE. Public Hearing #2 - A request for major changes at the Wild Goose, 430 and 436 East 17th Street, HERE. This has been requested to be continued until February 24, 2014. Public Hearing #3 - A 36-unit development at 2023, 2025 and 2027 Placentia Ave. HERE. Public Hearing #4 - A Conditional Use Permit to sell wine at 3315 Hyland Avenue, Suite H, HERE. Public Hearing #5 - A Conditional Use Permit to sell distilled spirits at 3313 Hyland Avenue, Suite #A6, HERE. Report on G&W Towing CUP status and recent noise complaint, HERE. If you take a few minutes and scan those charts you'll find some interesting information. 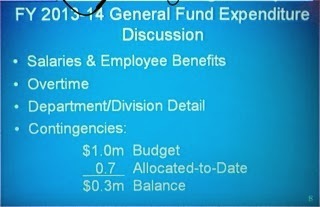 For example, on #8 you will see that almost 70% of the Contingency Fund has been depleted, and how. Under #7 you'll see a department-by-department list of how much of the budget for salaries and benefits have been used during the first six months of the fiscal year. For example, the CEO's Office has only 40.28% remaining while the several segments of the Police Department have significantly more than 50% remaining. 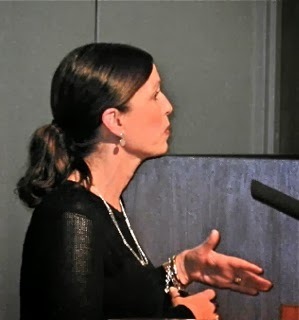 On Wednesday, February 12, 2014 the Costa Mesa Charter Committee, facilitated by Drs. Kirk Bauermeiser and Mike Decker, meets again to continue its relentless slog toward the creation of a Charter document that the City Council will find acceptable. The meeting changes venues this time and will meet beginning at 6:00 p.m. in Conference Room 1A - a much cozier venue than the Emergency Operations Center, which is not available. The agenda may be viewed HERE. A Review of the Minutes, HERE. Meeting Summary and Review of Norms, HERE. A look at this agenda gives me the sense that it will be a long meeting and it's likely that they won't finish all the items on the schedule. The clock is ticking since they hope to have a final document ready to present to the City Council by the end of this month. We'll see. And, for you rabid partisans, the Newport Mesa Tea Partiers hold their monthly meeting on Thursday, February 13, 2014 at the Halecrest Swim and Tennis Club, 3107 Killeybrooke Lane from 6:30 - 8:30 and will feature among the speakers the grand pooba himself, Scott Baugh, plus Second District Supervisor candidates Michelle Steel and Allan Mansoor. I will not be at this one, but I suspect Old Barry Friedland will have his Costa Mesa Brief camera on hand to film the event and post it on his YouTube site.